toon|Audio Tone Generator Lite Support - toon,llc. 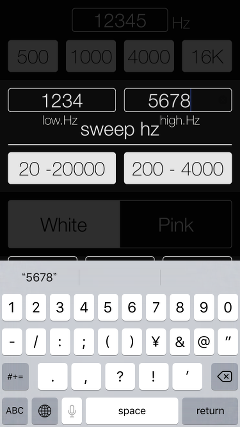 Audio Tone Generator Lite - Reference signal generator for Audio / Free of charge! "Audio Tone Generator Lite" will help you to make the sound benchmark for your audio equipment and loudspeakers, your listening environment and room acoustics or your hearing. In addition, by having you to use it in conjunction with our Real-time Audio Analyzer app "fo-Kannon" or "Audio Frequency Analyzer", it can be easily measured the frequency response of your Audio system. 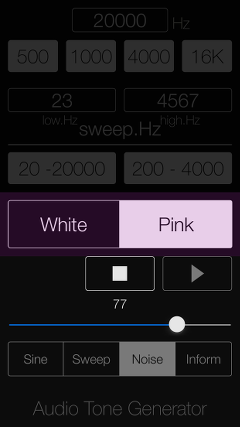 Please use the "Audio Tone Generator Lite" app as the standard pink noise signal generator. 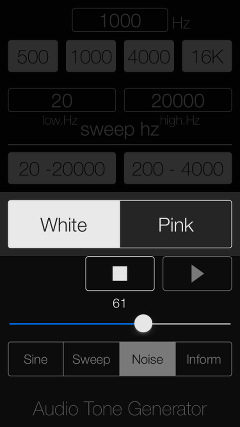 Please to click the following link to download "Audio Tone Generator Lite" from App StoreTM. It will be open the download page on App StoreTM. Recommendation : Requires iOS 12.0 or later. 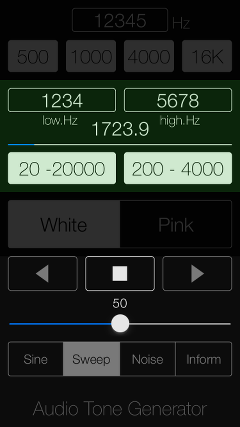 "Audio Tone Generator Lite" app can generate the following signals. Testing and tuning Audio amplifiers, Equalizers and many other Audio equipments. Frequecy response testing for Audio systems using White and Pink noise generation. Top view has the operation setting area at the top, and the control area at the bottom. In the control area, you can select one operating mode from Sine-wave mode(Sine), Sinewave sweep mode (Sweep) and noise mode (Noise) and Information view (Inform). In addition, you will be able to control the playback volume, Play/Stop. At the first boot of this app, Information view is displayed, so please check how to use it. This is the Sinewave signal generation mode. It generates a single tone between 20kHz from 20Hz. 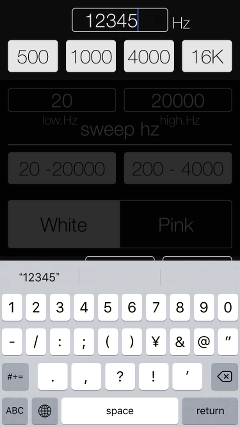 If you tap the frequency display monitor, it is possible to use the keyboard. In the keyboard input, you should set a frequency of 20kHz from 20Hz. It should be noted that the initial application startup, the initial value does not set, it need to set an integer value of frequency. Further, by tapping a preset frequency button can be set from four preset types. By tapping "PLAY" button in the control area, it generates a tone signal. It stops the signal generation by tapping "STOP" button. This is the Sinewave Sweep signal generation mode. It generates a sine wave of transitional frequency continuously in the frequency range of 20000Hz from 20Hz. If you tap the frequency monitor display, it is possible to use the keyboard. In the keyboard input, you should set both the upper and lower limit frequency. It should note that the initial value is not set at the application startup, it need to set the integer value of both frequency. In addition, by tapping a preset button, you can set from two types. There is two types of "PLAY" button that can be generated rising sweep and downward sweep. It generates a tone signal sweep by tapping "PLAY" button in the control area, and then sweep the full frequency range at 60 seconds. It stops the signal generation by tapping "STOP" button. This is Pink noise or White noise generation mode. 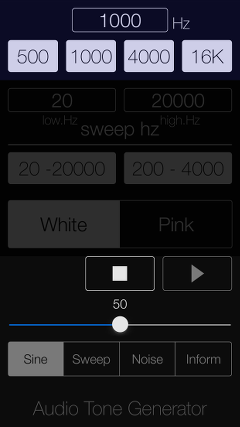 At first select whether "WHITE" or "PINK" and tap the "PLAY" button in the control area, the noise generation will start. It stops the signal generation by tapping the STOP button. By tapping "Inform" button, it is displayed this information view of product information and usage. If you tap the "Support/Information", Safari starts and you can see our support page. If you return the operation, please tap the other Mode button. At the first boot of this app, this view is displayed, so please check how to use it. "Audio Tone Generator Lite" version 4.0 was released on October 11, 2018. * Correspond to iOS12.0. Redesign of UI. Performance improvement. 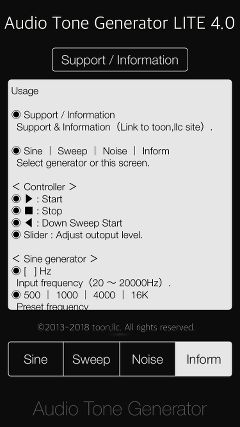 "Audio Tone Generator Lite" version 3.3 was released on May 18, 2018. * Correspond to iOS11.3. Improved stability. "Audio Tone Generator Lite" version 3.2 was released on March 12, 2018. * Correspond to iOS11.2. Redesign of UI. Performance improvement. "Audio Tone Generator Lite" version 3.1 was released on May 19, 2017. * Redesign of UI. Performance improvement. 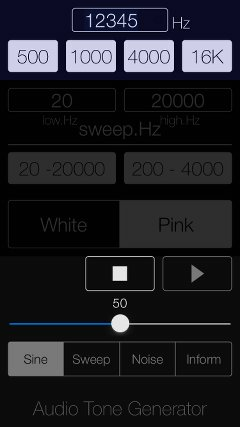 "Audio Tone Generator Lite" version 3.0.2 was released on December 4, 2016. "Audio Tone Generator Lite" version 3.0 was released on November 22, 2016. * Correspond to iOS10.1, Redesign of UI, Performance improvement. "Audio Tone Generator Lite" version 2.4 was released on May 27, 2016. "Audio Tone Generator Lite" version 2.3 was released on March 9, 2016. 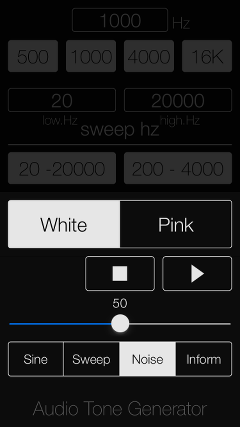 "Audio Tone Generator Lite" version 2.2 was released on January 5, 2016. 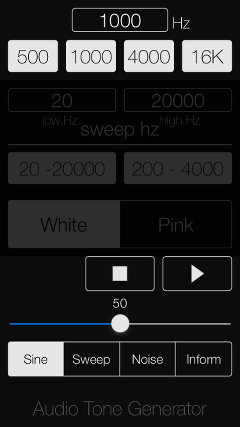 "Audio Tone Generator Lite" version 2.1 was released on October 5, 2015. "Audio Tone Generator Lite" version 2.0 was released on November 1, 2014. * Supports for iOS8, Redesign of UI, App name changed. Performance improvement. "Audio Tone Generator Free" version 1.4 was released on April 8, 2014. * App name changed. Performance improvement. "AudioToneG" version 1.3 was released on February 5, 2014. "AudioToneG" version 1.2 was released on October 22, 2013. * Supports for iOS7, Redesign of UI, Performance improvement. "AudioToneG" version 1.1.0 was improved on June 13, 2013. "AudioToneG" version 1.0.0 was released on April 16, 2013. If the silent mode is turned on, all iPhone sound outputs are disabled. To enable the sound output, please be sure to turn off the silent mode in the iPhone' settings, "Settings/Sounds" or Control Center. On the keyboard-input of frequency, please press the return key after entering a numeric value. Also, in the sinewave sweep mode, please press the return key after entering two numeric values continuously.